Plant propagation has changed a lot in the last few years. Gone are the days of rooting powders and trays of sand. This kit combines all the products needed for success in the modern way â€“ a great introduction to the technology. This kit makes a great present for the gardener in your life. Root Riot! 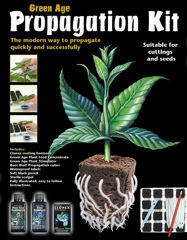 is the new organic propagation medium. Made from composted organic materials, these new cubes have a great spongy texture which retains the perfect air / water ratio for healthy rapid root growth. Specially inoculated with micro nutrients; to nourish the young plants, and also beneficial rooting fungi to aid root development.